I’m inspired by the response to my last post to more regularly share details about Sam’s meals. Because I know busy mommas are always looking for simple food to satisfy their kiddos! Yes, Sam eats what we eat, but I also often plan our menu with him in mind. Honestly, it encourages us to eat healthier. Our meals have become more balanced and more colorful. They also contain less sugar and more wholesome ingredients. 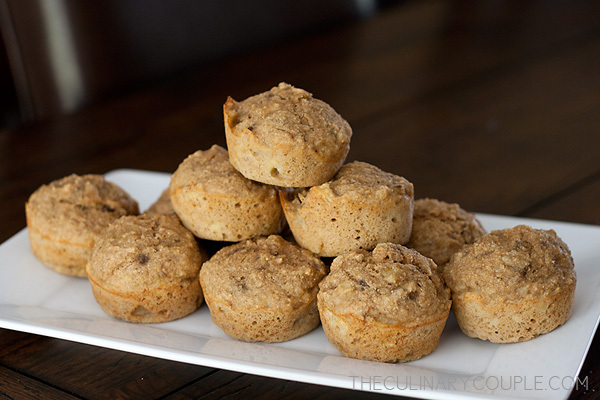 These muffins are made of just six ingredients: whole wheat flour, baking soda, cinnamon, butter, eggs, and bananas. They’re perfect for breakfast or an afternoon snack. Simply combine the dry ingredients. Then mash the bananas until they are thick and smooth, and add the melted butter and eggs. 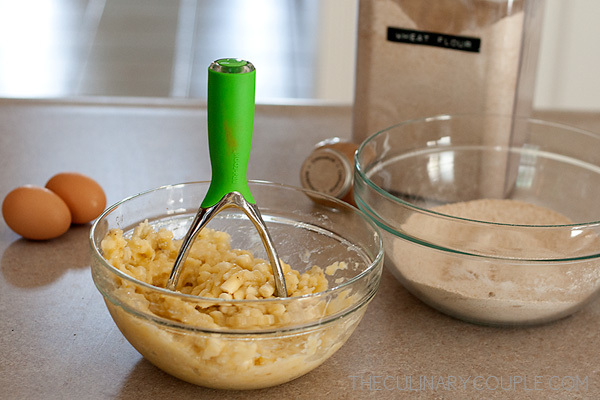 Add the wet ingredients to the dry ingredients and mix well. Then scoop the batter into a greased muffin tin. Bake at 375°F for 10 to 15 minutes until the muffins are light brown and spring back to the touch. 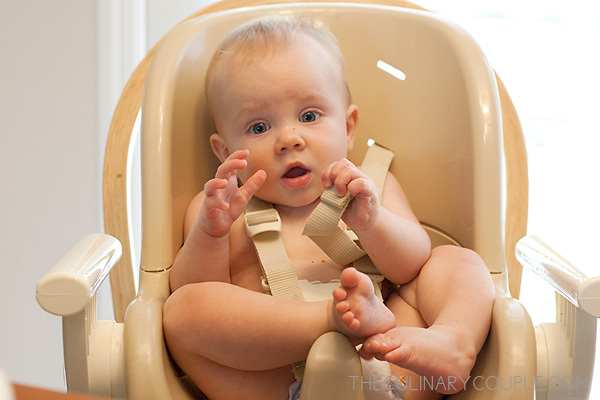 Let them cool for at least 5 minutes, and then watch your munchkin gobble them up! Also? These muffins freeze really well. 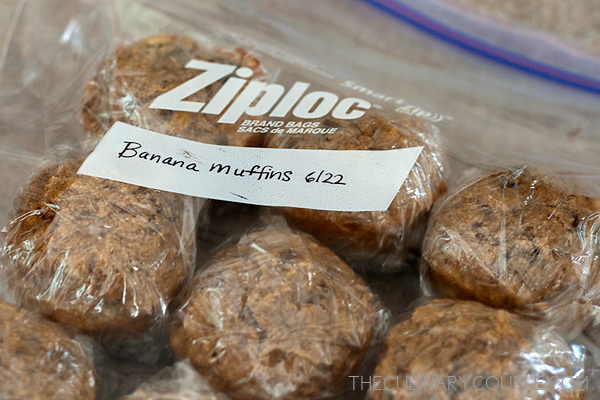 Just wrap each muffin in plastic wrap and stack them in a freezer bag. Pull one out at least an hour before serving it to allow it to come to room temperature. You could also warm it in a toaster oven. Did I mention that Nick and I enjoy these as much as Sam? Bonus! Preheat the oven to 375°F. Lightly grease a muffin tin or line with paper. Sift together flour, baking powder, and cinnamon in a large bowl. Then make a well in the center. Mash the bananas to a smooth, thick consistency. Then add the melted butter and eggs and mix well. 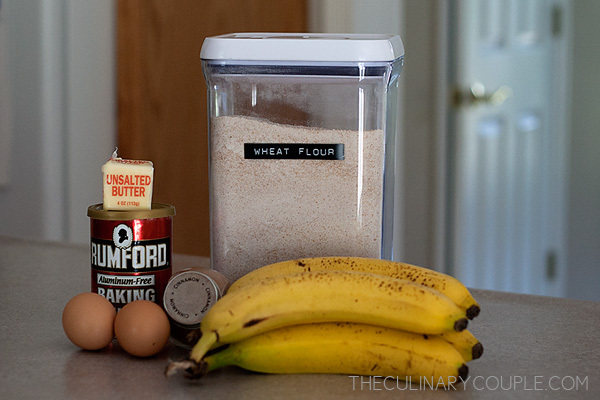 Pour the banana mixture into the dry mixture and fold together lightly. 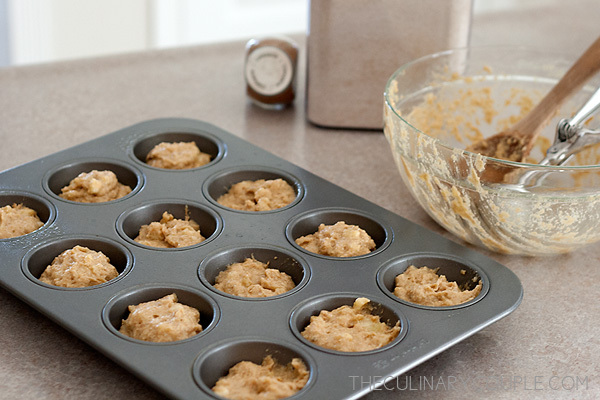 Spoon into the prepared muffin tin and bake for 10 to 15 minutes until the muffins are light brown and spring back to the touch. Cool for 5 minutes before removing them from the pan. Love that you are going to give us some tips! I am trying to get my family eating more wholesome foods! I just made these this afternoon and they are great. I can’t wait to share them with my daughter. We just started table food with her. I am excited for all your upcoming posts!!! P LOVES muffins. and smoothies. its pretty much a sure way to get her to eat. Awesome recipe! Thank you so much for posting it! 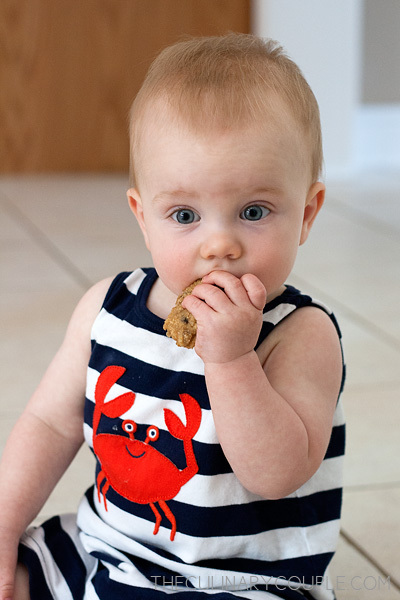 I will definitely be making these for Lula!